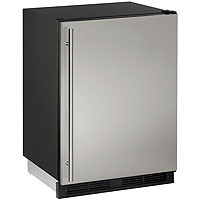 Offering additional capacity for the kitchen or the flexibility of storing both refrigerated and frozen items wherever they are needed, this 1000 Series Refrigerator and Freezer 1224RFS-00B by U-Line is the industry's only Built-In Undercounter Refrigerator/Freezer with Frost-Free Technology. This Refrigeration Unit features a Removable Clear Crisper Drawer that helps optimize product storage, Three Tempered Glass Shelves with Bullnose Edges that help contain spills, and Contoured and Adjustable In-Door Storage Shelves that accommodate larger containers including a 2-liter bottle. The Refrigeration Section maintains a Temperature of 341/21/21/21/2°F to 451/21/21/21/2°F. The Freezer Section maintains a Temperature of 01/21/21/21/2°F to +51/21/21/21/2°F and features a Vertical Design that allows for greater storage options. This Combination Refrigerator and Freezer Unit also features an Interior Light, an Audible Door Open Alarm, a Self-Closing Door Mechanism, a Contemporary Black Toe Kick Grille, and Adjustable Leveling Legs. Comments: I got this on sale for $1,619 and it was a great buy. I really like having the freezer for keeping some ice, but having room for larger items like ice cream is nice too. I know another version has an ice maker, but we just don't use that much ice in our basement. Trust me when I say things will stay frozen in there if you want to put in an ice tray! Even things around the freezer get a little icy/slushy. The door is reversible which is great. The size of it is substantial but the feet are still adjustable to a nice height. I cannot ever hear it running, so all around I'd give this little fridge an A!